Human rights defenders across the world today have to overcome restrictive and challenging circumstances to undertake their mandate. These challenges could be broadly classified into three categories. They are: (i) restrictions imposed through statutes or regulatory processes; (ii) false accusations and fabricated cases registered by the state against HRDs and their organisations; and (iii) threats presented against HRDs by non-state actors, including fundamentalist religious forces. Bangladesh, against all its obligations under domestic and international law detainsHRDs, forces closure of civil society organisations by repeatedly raiding their offices and seizing office equipment and documents, and does not allow these organisations to operate their bank accounts. India too engages in similar tactics against civil society organisations that openly criticise the government and its policies. Similar circumstances exist in most other states in the region, including Singapore, Myanmar, Indonesia, Sri Lanka and the Philippines. In all the above circumstances, what is witnessed is the increasing role played by the entire criminal justice apparatus in Asian states that collude with the state in repressing HRDs and civil society work. Asian states liberally use their agencies like the police, prosecutor\’s office and other specialised agencies to obstruct HRDs in their work, often alleging false criminal charges against organisations or the staff members of these organisations. On the other hand, Asian judiciary has repeatedly failed to intervene in these cases despite the civil society reaching out to the courts for justice. Improving Asia\’s human rights standards is not possible without radical reforms brought into the region’s justice delivery framework, particularly of the criminal justice procedures. The absence of independence and professionalism of Asia’s justice architecture is the cornerstone upon which impunity is built in the region. Asian states are aware of this and has consciously kept their justice institutions under direct control. Today Asian HRDs and the entire civil society in the region suffers due to this. Effective judicial intervention in instances where the state exceeds its mandate and stifle civil society work is an exception than a norm. The side event organised by the Asian Legal Resource Centre, along with its partner The Right Livelihood Award Foundation is an attempt to expose the dubious role played by Asia’s justice institutions in stifling civil society work in the region. The event is also an attempt to raise awareness about this scenario in the global human rights community and to seek support to address this problem. Law on Administration of Activities of Overseas Nongovernmental Organisations in the Mainland of China, that came into operation from 1 January 2017. Prior to this, as early as in April 2016, immediately after the law was passed the law was for all practical purposes put in use. In November 2016, the practice of enforcing the law in letter and spirit was informally regularised by a set of guidelines, though the law was only set to be in force from 1 January 2017. It is a practice in China for the government to first restrict freedom, and later legalise the practice by legislations, which was also followed in the case of Law on Administration of Activities of Overseas Nongovernmental Organisations. RSVP: Md. 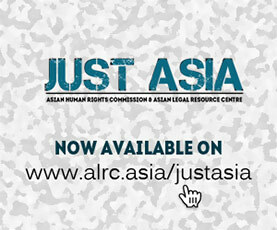 Ashrafuzzaman, Main Representative, Asian Legal Resource Centre, Cell: +41 (0) 766 38 26 59, Email: zaman@ahrc.asia . « ASIA: Are Asia’s criminal justice institutions capable of addressing torture?